Spring may not be the time of year when people expect to see Goldenrod. But it is the time of year when several people (especially in Florida) may need to use it. Goldenrod (Solidago spp.) blooms around the same time as Ragweed (Ambrosia psilostachya) and, unfortunately, has been accused of causing seasonal allergies in late summer to early fall. However Ragweed is typically the allergenic culprit. 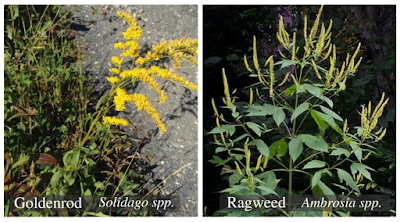 Goldenrod actually has very little pollen with which to cause allergy problems. And the pollen it does have is sticky so it rarely gets to be airborne. 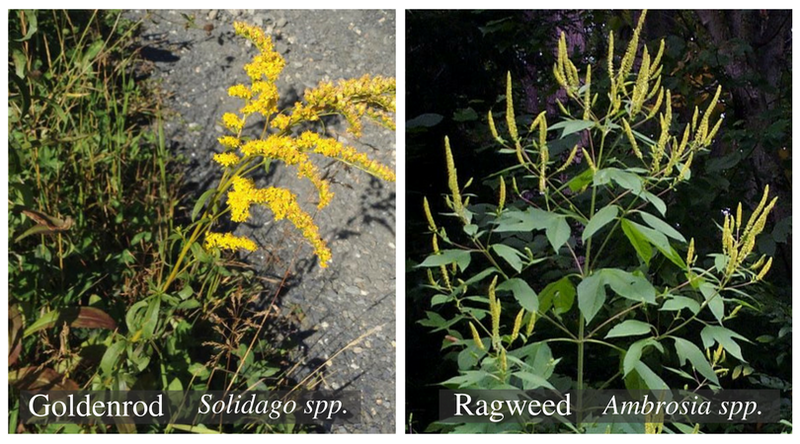 Most people who have been introduced to both plants don't know how they could be mistaken as Goldenrod's flowers are beautifully golden while Ragweed has nondescript green flowers. Even though they're both in the Asteraceae family, there's a really good bit of differences between the two, and the Herbal Academy has a very detailed blog post about just that. Goldenrod grows just about everywhere from North America to Europe, and even all the way to Asia. There are over 100 species and all of them are beneficial in several ways. The two considered to be the most medicinally beneficial are Solidago canadensis and Solidago odora. Even the colonists loved Goldenrod. After the Boston Tea Party, Goldenrod tea, which they called “Liberty Tea,” became so popular that it ended up being exported to China. Summary of Actions- Diuretic, drying, aromatic, antioxidant, expectorant, antifungal, anticatarrhal, anti-inflammatory, antimicrobial, antiseptic, astringent, carminative, vulnerary, tonic, and diaphoretic. Traditional Chinese Medicine (TCM)- Known as Huang Hua, Goldenrod is pungent, bitter, and cool. The meridians it works best on are the liver and gallbladder meridians. Goldenrod is used to dispel wind and clear heat, resolve swelling and remove toxicity. Especially useful when there is a sore throat, jaundice, headache, cold, urinary tract infections (UTI), kidney stones, fungal infection on the hands, or swelling on the back. 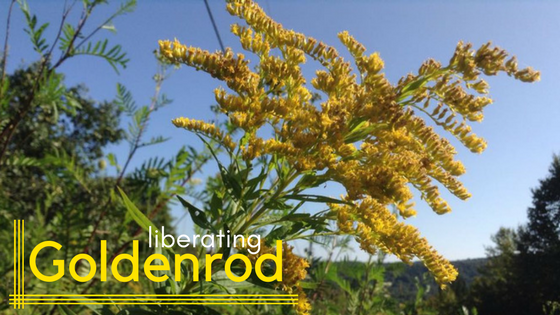 Seasonal Allergies- Goldenrod has an amazing ability to calm the runny eyes, runny nose, and sneezing that comes with seasonal allergies. Even Ragweed allergies. It's also an amazing decongestant. Sinusitis, Flu, & the Common Cold- Goldenrod is antiseptic and antimicrobial, which makes it a great choice for dealing with a sore throat along with other symptoms of the flu, cold, and/or sinus infections. It also has great expectorant properties to help expel mucus from the lungs, and decongestant properties to dry those pesky sinuses. It's also extremely beneficial when fever is involved, as it helps open the pores and allows the body to sweat out the fever more efficiently. Cardiovascular Health- Goldenrod is an excellent source of rutin which helps support circulation and capillary strength. It also shows promise in the lowering of cholesterol and preventing atherosclerosis. Skin & Wound Care- Goldenrod's scientific name, Solidago, means “to make whole.” It certainly seems to work wonders on wounds. Helping speed their healing and preventing infections. It's also a great ally when dealing with eczema and other chronic skin conditions. Bladder & Urinary Track- Goldenrod is super useful for the urinary system. It's astringent and antiseptic properties make it useful for treating both bladder and urinary tract infections. It strengthens and tones the urinary system and helps reduce inflammation in both the urinary track and bladder. Anti-Fungal- Goldenrod works well to help deal with Candida type yeast infections such as thrush or vaginal yeast infections. Muscle Pain & Arthritis- Recently, Goldenrod has become fairly well known to help relieve a wide variety of aches and pains. It's especially known to help muscle pain and arthritis. Contraindications and Warnings- Goldenrod can be overly drying to those with a dry constitution, if taken over a long period of time. Consult your doctor, midwife, or herbalist before taking Goldenrod if you are pregnant, have heart problems, or have kidney problems. Minor allergic reactions may occur in a, very, few people. I only included a basic introduction to this amazing herb. I hope you have learned a new appreciation for how amazing goldenrod is. If you have any questions or comments, please leave them below. And these amazing pictures are thanks to my friend Shannon at Ancient Grove Yoga and Wellness. 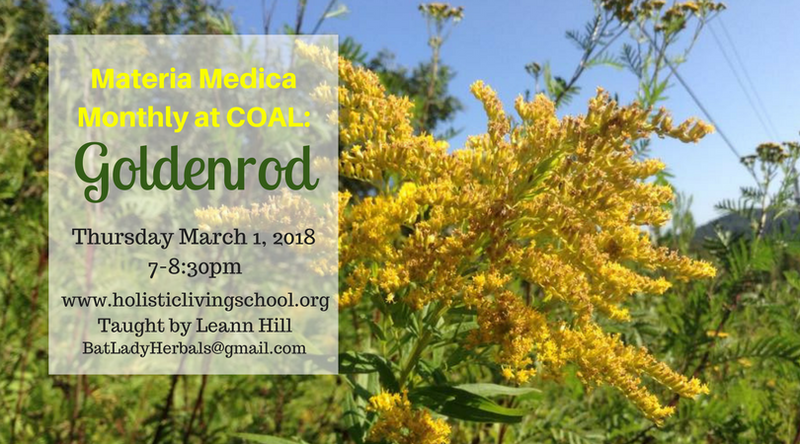 If you want to learn more about this amazing plant, join me at COAL on March 1, 2018 for our Monthly Materia Medica. For more information, contact Leann at BatLadyHerbals@gmail.com or visit the Florida School of Holistic Living in Orlando, FL.